One day remains unless a ‘special session’ is called… The legislative effort to a reverse an unpopular change in a law impacting the martial arts business community is running out of time. 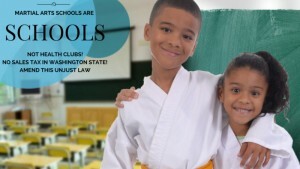 An oversight in a law passed to simplify taxation of ‘Amusement and Recreation’ activities in the State of Washington in 2015 reclassified martial arts schools as an ‘Athletic or Fitness Facility’ predominantly used for ‘physical fitness activities’ or exercise. One result, starting January 1, 2016, was that schools were required to charge retail sales tax on their tuition, up to 9.9% in the state, or risk owing thousands in back taxes in the event of an audit. A before and after comparison chart available online at the Washington Stage Legislative website as part of the bill history for HB2539, which became HB1550, shows only two activities changed from ‘service’ to ‘retail sale’ status, 1) ‘amusement park admission fees’ and 2) ‘martial arts’, while similar practices like yoga, tai chi and chi gong as well golf, skiing, skating, swim and riding lessons were given specific exemptions. Dance, ballet and gymnastics retained their tax free status and close to 30 other activities including hockey, lawn bowling, mud runs, soccer and civil war reenactments changed from taxable to sales tax free. Lumping schools into the ‘health club’ definition outraged participants and school owners alike who thought they were learning or teaching self-defense, cultural art forms, character development for kids and for many, a way to better mental, spiritual and physical health alike. In response, a Washington State Martial Arts Association (WSMAA) was formed and school owners, supporters and students have been fighting alongside legislators since October 13, 2015, when notice was first received. A petition on change.org to alter the law has been signed by over 6,500 supporters. The State of Washington has one of the highest average sales tax rates in the country, according to a 2014 study by The Tax Foundation, and school owners are already reporting that the new tax, up to 9.9%, has had a chilling effect on their businesses. Tuition at martial arts schools typically exceeds $120 a month and the law requires sales tax on anything occurring inside their facilities including testing, private lessons, workshops and special events. Families with multiple siblings enrolled have been especially hard hit. The sudden increase in cancelled memberships and a slowdown of new students has left some schools with their worst January performance in 5 to 10 years. One school owner reported a 28% decrease over last year. Without a solution quickly dozens of schools are expected to lay-off employees or go out of business by years’ end, according to board members of the Washington State Martial Arts Association. Through a grassroots effort the martial arts community was able to rally together and gain bi-partisan support from the House of Representatives to correct the issue. Rep. Cindy Ryu was the prime sponsor of a House bill, HB2334, to restore equal treatment that passed 96-0 on February 11th. 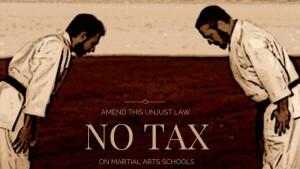 The bill was sent to the Senate but stalled out in committee because the new ‘exemption’ for martial arts required to fix the oversight was being labeled a ‘tax preference’. The bill missed the typical window for passage but remained alive due to its ‘necessary to implement the budget’ status. Martial arts supporters and the WSMAA organized an email and phone call campaign and even went door to door to visit Senate offices to make their case. Republican leadership came through at the last minute and passed the bill out of committee on March 9th. To succeed the bill still needs to get a vote and pass by a majority on the Senate floor and get signed by Governor Inslee. With the end of the legislative session scheduled for tomorrow, 03/10/2016, it is unclear if enough time remains. One glimmer of hope is the potential for an ‘extended session’. If the Senate doesn’t allow a vote tomorrow an education in martial arts and self-defense will continue to be taxed until at least April 1, 2017 provided another bill makes it through the process next year.